Samnang Sum is studying in grade six at Udom Sorya Primary School in Takeo province, regional Cambodia. As a participant of Cufa’s Children’s Financial Literacy (CFL) program, Samnang has been able to change his financial habits. He has opened a savings account and is making contributions with a goal. He is aiming to support his education and become an engineer in Cambodia. Samnang is the oldest son in a family of five. As the oldest, he does most of the housework. These duties include taking care of the animals and cleaning when his parents are not home. Due to this, his father, who works as a local vet, gives him 1500 Riels ($0.50 AUD) a day to take to school. Initially, before Samnang was taught by the CFL program, he liked spending this money on snacks and toys, without thinking about how hard his parents worked to provide him with this money. The CFL program taught Samnang about managing his savings and developing a short and long-term goal. It also assisted in him opening a savings account with his local village savings bank. Cufa project officers use a variety of mediums to teach financial literacy ranging from workbooks and tablets in school to home visits to reinforce the lessons and check the progress. Due to the CFL program, Samnang has been much more attentive to his savings. He better understands the value of money and how hard his parents work to earn for their family. Consequently, he has been able to save around $200 USD in his savings account over the past 2 years. 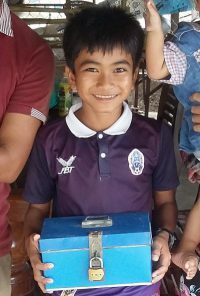 Now Samnang has made his long-term savings goal to save up enough money to pay for a tertiary education to become an engineer in Cambodia! Cufa’s Children’s Financial Literacy program has taught over 90,000 children since its inception. In the past 3 years, 66% of participants have been actively saving. Since the CFL program started in 2008, the average monthly savings from each child has increased by 236% from $0.89 to $2.99.